Hammas is a complete software solution that helps to improve business productivity and quality of care through a thought-out, user-friendly design and innovative technology. 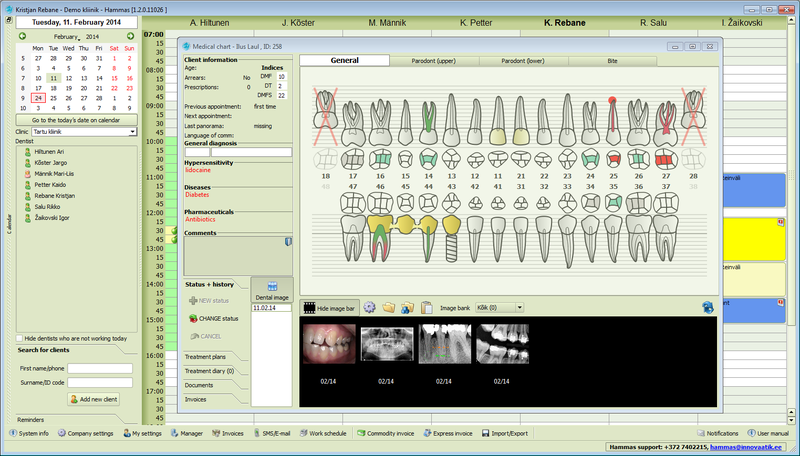 Foremost it is the complete dental chart, which is also simple and intuitive. Users have secure access to their data over encrypted channel from everywhere in the world. There is no necessity for clinics to invest in expensive servers and backup systems. Hammas is in accordance with the latest standards and requirements by eHealth Foundation and Information System’s Authority. Our software is directly integrated with several sensors and x-ray machines like Planmeca, Sirona, Digora, Visiodent, Kodak, Fimet, Sopix, etc. Clinics can install a plugin to their website, which then allows for their customers book an appointment themselves. Reminders can be sent via SMS messages and/or e-mails. Hammas runs on Windows, Linux and Mac OS. Complete dental chart, which is also simple and intuitive. Detailed patient medical history and anamnesis. Real-time patient health insurance eligibility verification. Quick access to digital images. Pre-filled treatment plan and cost estimation. Creating electronic prescriptions in a few easy steps. 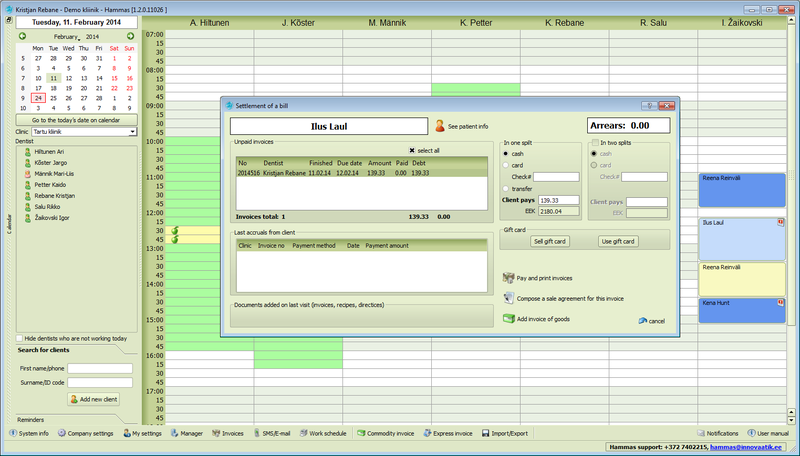 Seamless creation of bills based on completed procedures. Specific price lists based on a speciality or the clinic. Automatic updates to price list of Health Insurance Fund. Statistics on waiting lists, visits, etc. Comprehensive reporting including detailed turnover, worked hours, accounts receivable, etc. Send appointment reminders via email or SMS. Comprehensive color coded scheduler views. Online booking plugins for CMS including WordPress and Joomla. Patient quick finder and health insurance eligibility verification. Displaying previous no shows and outstanding balance on visits. Accept cash, credit card payments and bank transfers. If you have any further questions, would like us to contact you regarding a free demo or schedule a training then please don’t hesitate to contact us.